Today, not much has happened. I regrassed an area of the garden where I’d moved some rhododendrons from. I’m not sure the seed is still viable or whether it’s a bad time to sow it but I’ve done it anyway. Watch and wait I guess. As there’s not much to report, I’ll share my recipe for my freezable curry paste balls. Mix the ingredients together in a bowl and divide the resulting paste into two. Roll into two balls which will be like two golf balls. Either use immediately or place in a container and freeze for later use. You will need one ball per meal for 4. I double the recipe and have enough for the next few weeks. 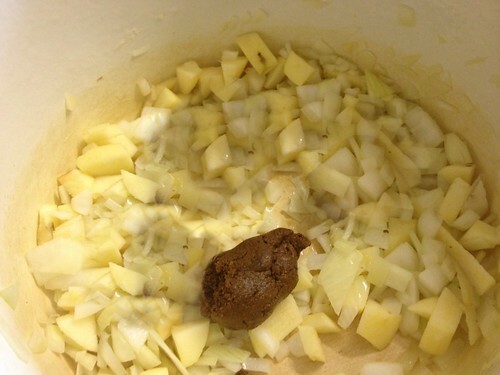 To make a curry with the paste, simply chop an onion, an apple and cube some meat (I have used this method for beef, venison, lamb and goat to great success). In a stock pot, brown the meat in some olive oil, add the onions, apple and one curry paste ball. Stir until paste ball has broken down and has coated the onion and meat. Gradually add 2 pints of hot stock (I use 2 oxos in a pint of boiling water). Stir well and cover pot with a lid. Either turn down the heat on the hob or place in an oven at 160c. Cook for 2 hours, checking every half hour.